Not content with creating a best-selling construction toy, Hornby continued on the logical path from Meccano to develop a new product in the form of an ‘O’ gauge train set, intended to rival the tinplate tradition of Germany (see an earlier blog post on Bing tinplate toys by clicking here). Since the 1920s these trains have been the inventor’s namesake. Quickly realising that the toy train enthusiast wanted to make their railway layouts as realistic as possible, various accessories were added to production. 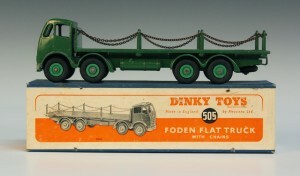 Meccano Limited expanded their output to include a range of vehicles to accompany the ‘O’ gauge series, perhaps influenced by the arrival of the American ‘Tootsie Toy’ vehicles. This first group of six vehicles did not bear the Dinky Toy name but were instead called Hornby Series ‘Modelled Miniatures’. 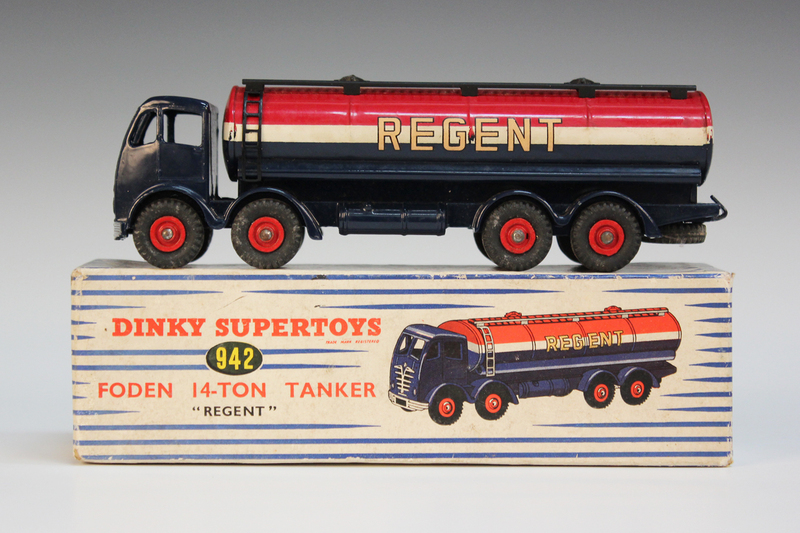 Toovey’s sold two of these early Modelled Miniatures in our specialist auction of Toys on 25th March 2014. No. 22a an open sports car, finished in red and cream, sold for £100, and No. 22b a sports coupe, finished in yellow and green, sold for £380. 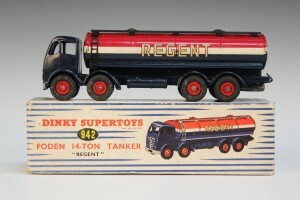 They are particularly prized among collectors as they are still deemed among the first Dinky Toys, despite the different branding. Hornby soon dismissed ‘Modelled Miniatures’ and ‘Meccano Miniatures’ in favour of the more catchy ‘Dinky Toys’. From then on, generations of children enjoyed playing with ‘Dinkies’. 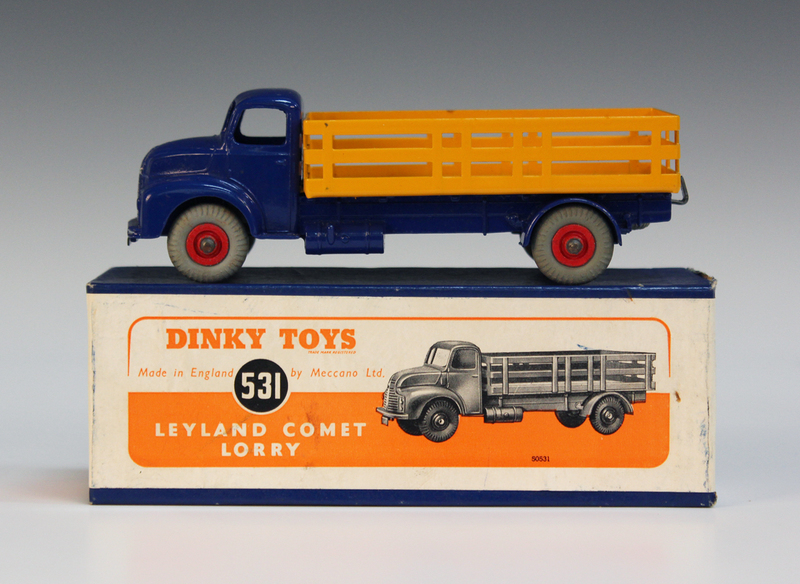 Dinky derives from the Scottish and literally means attractively small and neat, a perfectly apt description of the vehicles produced by the firm. The Second World War halted production of toys at the ‘Binns Road’ factory in Liverpool with attention turning to war work. They even raised funds for a ‘Meccano’ Spitfire by creating a special pendant to purchase the aircraft. Immediately after the war, the government insisted on Meccano focusing on their export market to help pay off the war debt. It was after the war years that Dinky Toys really enjoyed a renaissance period. 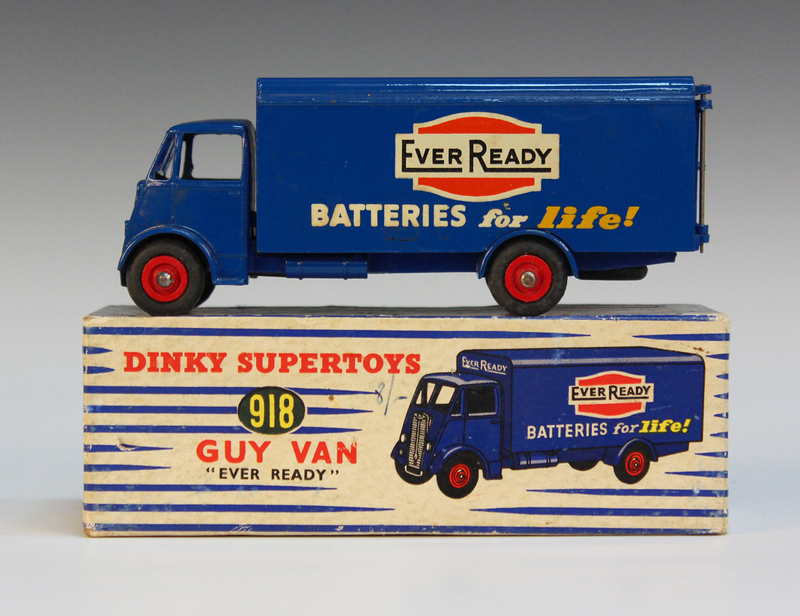 In 1947 Dinky ‘Supertoys’ were launched to great success. 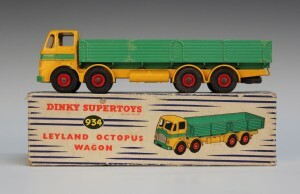 Dinky Supertoys were a larger scale than that previously offered and were produced for nearly two decades. 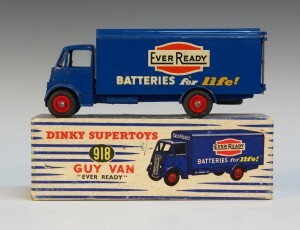 The entire range of Dinky vehicles included planes, military vehicles, cars, vans and lorries. In their striking boxes and bold colours, these are as prized among collectors today as they were coveted by children of the day. The brand enjoyed great success until the Liverpool factory closed its doors in November 1979. The brand name was later purchased by Matchbox but, after various mergers, it was eventually swallowed up by Mattel’s ‘Hot Wheels’ brand. 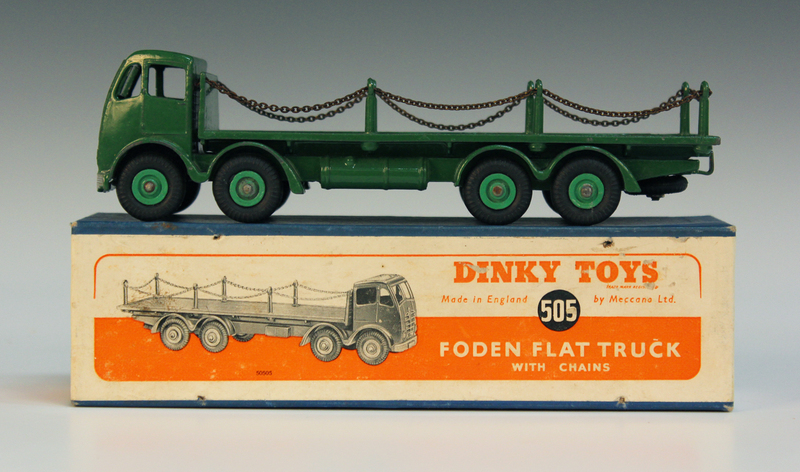 Toovey’s forthcoming specialist auction of Toys, Dolls and Games on 15th July 2014 features the usual fantastic selection of Dinky Toys and other die-cast metal vehicles. 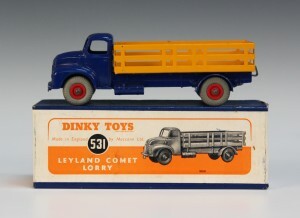 Among the offerings in the auction is this post-war Dinky Toys No. 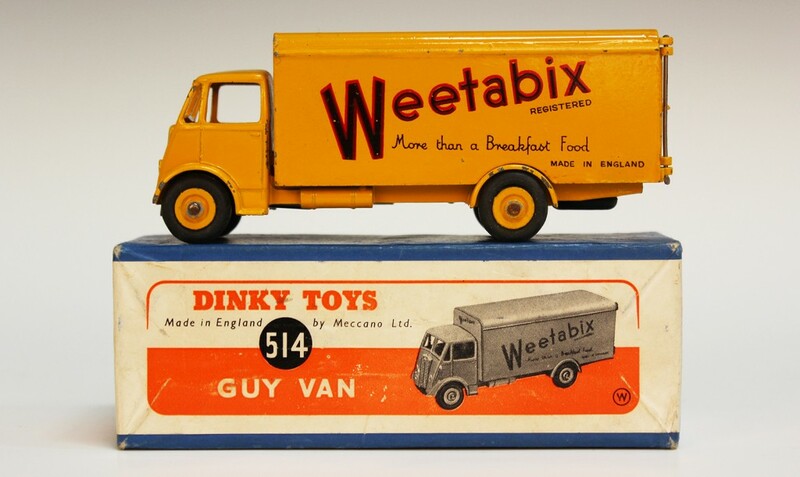 514 ‘Weetabix’ Guy van with first type cab and second type wheels. Offered with the all-important original box, it carries a pre-sale estimate of £300-500. 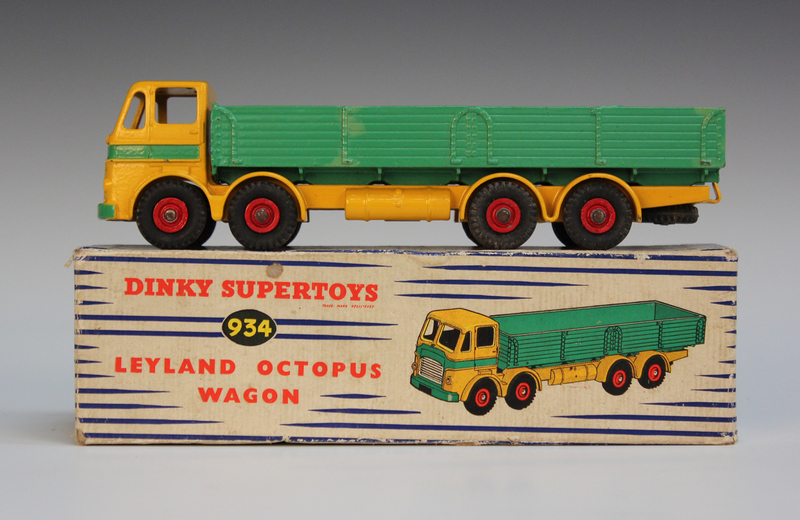 A good selection of other Dinky Toys and Dinky Supertoys vehicles included in the sale are also illustrated. Viewing for the sale is on Saturday 12th July between 9.30am and 12 noon; Monday 14th July between 10am and 4pm; and on the day of the auction, Tuesday 15th July, between 10am and 1pm. The auction commences at 1.30pm. Click here to view the online catalogue.